Robin is now holding seminars to inspire you and significantly develop your psychotherapeutic knowledge using his unique and highly respected combination of Rational Emotive Behaviour Therapy and hypnotherapy. 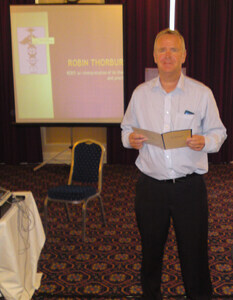 A review of Robin Thorburn’s presentation at The National College of Hypnosis and Psychotherapy conference in June 2011, Leicester by Hilary Norris. Here is what Dr Albert Ellis founder of Cognitive/Rational Emotive Behaviour Therapy and voted second most influential psychologist of the last 100 years described Robin’s work as “definitely helpful and creative…there are many good things I could say…in general you have done an excellent job”. “Pnosis applauds and commends to the world’s attention Thorburn’s pioneering work in combining the insights of Psychiatrist/Clinical hypnotist Milton H. Erickson with those of Psycholgist Albert Ellis. Both of these great Psychotherapists left the world with insights that have not fully been assimilated by the professions of psychotherapy and hypnotism. Thorburn conjoining of the two potentially represents a signal event in the annals of the betterment of humanity. While of primary importance to clinical mental health professionals, Thorburn’s work offers an important contribution to professional hypnotists as well as psychotherapists” www.pnosis.com Ralph Benko Editor. Introduction to the teachings of Dr Albert Ellis and Rational Emotive Behaviour Therapy. Most psychological problems are a form of demandingness. Memory the impact and how to manage it. The ABC form and differences between Cognitive Behaviour Therapy and Rational Emotive Behaviour Therapy. Rational Emotive Imagery (REI). The Vicious Circle of Psychological Misery and the teachings of Dr Claire Weekes MBE, MB. D.Sc. F.R.A.C.P. Demonstration of Ellis’ therapeutic approach. Milton H. Erickson and the use of metaphors. Hypnotherapy its practice and use with Rational Emotive Imagery (REI). The Seminars are open to practitioners and the General Public. Please note that people suffering from Psychosis i.e. Schizophrenia/paranoia will not benefit from them.